Promote your training, courses, recruitment and events on our wall. Businesses, register to add. Young Graduate is looking for its next Head of Sales. The position will be located in our Manchester Office and will cover all aspects of Sales from developing sales strategy and plans, establish and maintaining relationships with key accounts and customers. Excellent sales, negotiation and communications skills are a given as ihs natural initiative, drive and enthusiasm. Fresh Off The Runway focuses’ on FRESH NEW, EMERGING FASHION DESIGNERS. This event provides a platform with a fashion catwalk as well as a pop-up market place. A range of student and independent designers exhibit bespoke, custom made, exclusive pieces. This event is also a great opportunity for fashion bloggers. New designers were given a chance to showcase their fashion designer to an audience of over 100 at Manchester’s Zion Arts Centre. Defero Consultancy was delighted to team up with other local businesses at Copley Academy to share career advice with students. Understanding the importance of supporting local communities and giving back, Defero was on hand to give as much information as possible on starting a career in Public Relations and Marketing. A group of work club members of the Barlow Moor Community Work Group (BMCA) were given a demonstration of how to use the Savvy Guest website. The group were keen to see which careers they could utilise their skills in. They enjoyed the demonstration and immediately started applying to meet company employees for a pre-career chat. BMCA has now joined Savvy Guest. 2014 sees Young Graduate reach a huge milestone of helping 30,000 children, young people and adult learners celebrate success . 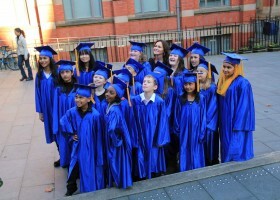 In collaboration with schools, universities, companies and projects, Young Graduate have supplied graduation cap and gowns to bring a sense of tradition and recognition of learning to many award ceremonies. ME1 Personal Development Coach Lisa, has been busy coaching girls on getting ready for their future careers. A session encouraging a group of girls to be ready for what the future holds was co ordinated by ME1. 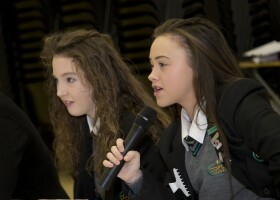 With the help of local businesses, the girls were able to ask questions about careers in business administration, The Royal Air Force and working with animals. 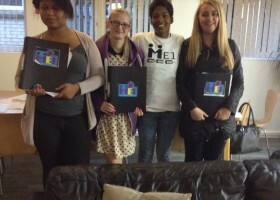 With ME1’s input the girls are now on their way in taking their first steps on to the career ladder! SavNav is a dedicated signposting page for companies to promote their training activities, courses, recruitment and events. CSR Wall is a dedicated place to showcase and share honest, authentic good CSR News Stories, which happen every day amongst our Business Communities. Register your Company today to promote and share.